It is our company philosophy to educate our clients so that they can make informed decisions about the plumbing in their homes, with that being said, today I would like to educate you on the importance of a water heater pan and what it means to your home to have one installed. 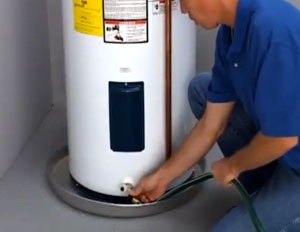 A water heater pan that is PROPERLY installed can be an absolute life-saver. Ok, it might not actually save lives but it does save homes. After thousands and thousands of water heater installations we’ve seen so many homes with serious property damage that could have been avoided had someone taken just a few minutes to educate homeowners on the importance and value of a water heater pan. Recently we had a client with a one week old baby call that her water heater “blew” over night and caused flooding in her garage. She really didn’t think too much of it since she thought the damage was isolated to just her garage but water has a funny way of traveling the path of least resistance as far as it can get. Our homes are primarily built of drywall, wood and insulation which are all incredibly absorbent materials and what she didn’t see at the time was the water had traveled through her walls into several other rooms. Our client has had to live in a hotel room for the last eight weeks with her husband and brand new baby while her home has been under massive reconstruction. If your water heater is over 6 years old and does not currently have a water heater pan we want to encourage you to check your water heater for moisture or rust on a monthly basis. When it is time to replace your water heater we highly recommend having a water heater pan properly installed at the time of replacement. Proper installation includes having the drain line run from the water heater pan to a safe location for the water to drain if your water heater decides to leak in the future. Unfortunately we too often see water heater pans just placed under a water heater and the drain line is never connected. This defeats the purpose and is just like putting a saucer under your coffee cup, it can only hold so much water before it overflows as well.